How One Email from You Could Help Students Succeed. In "Teaching: the Chronicle of Higher Education Newsletter." This brief piece explains the "classroom-based 'nudge, or intervention that encourages, but does not mandate, a certain behavior. Nudges have caught on as a way to help students through the many complex processes of higher education." 9 Aug 2018. Demystifying Office Hours for your Students. Teach your students how to go to office hours. Once they know what to expect from an office hour visit, they're far more likely to take you up on the invitation to come by--and far less likely to believe they will be eaten alive in the process. Group Work: The Importance of a Great Team by Erin Kasprzak. IDDblog, 30 July 2018. Best practices for your classroom; recommended further readings; quick read. Writing and Teaching: You and Your Students. Advice and encouragement for the start of the new semester from Cheryl Spector. 22 Jan. 2018. As You're Preparing the Syllabus by Maryellen Weimer. Faculty Focus, 10 Jan. 2018. Excerpts: "Tone matters as much as content." "Downsize policies." "Think more like a map and less like a contract." Thinking outside the Office (Hours). Fiona Rawle-Close. National Teaching and Learning Forum, Volume 26, Number 4, May 2017. Excerpted by Rick Reis for the Tomorrow's Professor blog at https://tomprof.stanford.edu/posting/1587: "I decided to hold walking office hours...." Rawle-Close lives and works (and walks during office hours) in Toronto; here in LA, you could make this strategy work even better. You Never Get a Second Chance to Make a First Impression: First Year Retention Report from Institutional Research at CSUN in collaboration with the Office of Student Success Innovations and Undergraduate Studies. 5/24/17. Helping Students Learn from Texts. Tomorrow's Professor, 1551. Sample: "One of the biggest surprises that new faculty experience is that most students rarely read before coming to class – or after attending class for that matter. This observation is true across disciplines, but it may be even more of a problem in science classes." 3/16/17. 9 Tools for the Accidental Writing Teacher by Daveena Tauber. 6/30/16. CSUN faculty and staff heard a panel of campus experts discussing ways of handling problem behaviors in the classroom. Co-sponsored by CFA. Each year, about half of CSUN's new students enter as transfers. Here's a one-page document for faculty that highlights some challenges and opportunities for supporting transfer student success. Teaching nudge: At the beginning and end of each lecture I ask students "What questions do you have?" rather than "Do you have any questions?" The former elicits significantly more questions than the latter. The replies offer additional great ideas. Take a look at McCarthy's post and the comments. Want to get occasional emails about AFYE events and workshops? Fill out the AFYE sign-up form. 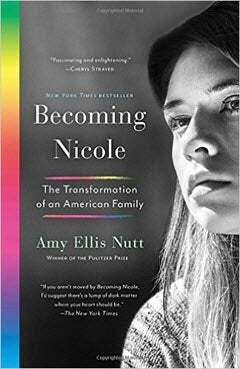 Becoming Nicole by Amy Ellis Nutt is CSUN's Freshman Common Reading for 2018-2019. Visit the faculty and staff resource page to find out more about the book, including summaries of the faculty-staff discussions of the book held during spring 2018, as well as discussion questions, assignment ideas, and suggestions for further reading.